Joe says "This is a photograph of my grandfather William Walsh, Stoker 1st Class, on the HMS Natal when it was destroyed in 1915. He lost his life like so many others. If any of your subscribers can give me any information on him or where I might find out more about him I would appreciate it." See also picture #1415. Joe, your Grandfather is remembered on the Chatham Naval Memorial - the inscription reads - In Memory of Stoker 1st Class WILLIAM WALSH SS/105456, (RFR/CH/B/8839). H.M.S. "Natal. ", Royal Navy who died on 30 December 1915. The link www.cwgc.org will take you to the Commonwealth War Graves Commission search page and from there you can link directly to your Grandfather's details. With his service number above you will be able to get further details from the MOD Military archive. Enjoy. Joe, I have done extensive research into the Natal and your grandfather is indeed on my list of casualties - it reads as follows, WALSH, WILLIAM. Stoker 1st class. SS105456(R.F.R.CH B.8839). Born 26.3.1889, Belfast, Antrim, Lived Belfast. NO KNOWN GRAVE. Please note that when it says lived at Belfast it means this is the location of the next of kin - he may never have lived there. Hope this is of some help. Many thanks to those who have commented on the above photograph. It's nice to know that those who died are still thought about. Hi, just looking at my album. I e-mailed a photograph some time ago and received confirmation of same being received.The photograph showed my grandfather William Walsh, another sailor unknown and his cousin in army uniform. Up to the present it has not appeared on the site or my album. Do I need to e-mail it again? Thank you for a great site. Yours, W J Gracey. 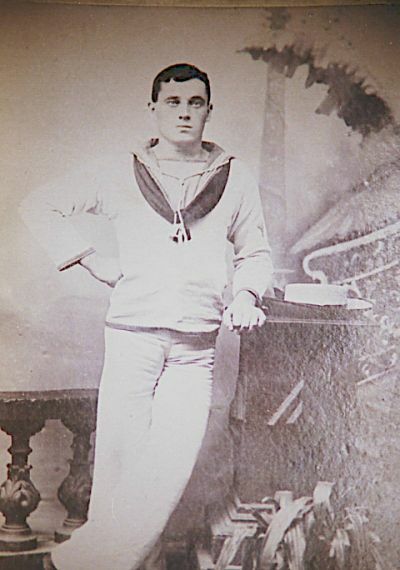 Are there records for a Fredrick Thurlow 1st class stoker?